Exercising is an important part of a person’s daily routine. It allows you to stay fit and far away from physical weaknesses that can lead to detrimental diseases if fostered over a prolonged period of time. One of the best exercising tools that can help you keep yourself in shape and away from conditions like, obesity, diabetes, thyroid, cholesterol, joint pain and much more, is the Exerpeutic 900xl extended capacity recumbent bike with pulse. Before we get onto learning the different benefits of choosing the Exerpeutic 900xl extended capacity recumbent bike with pulse and what experts have to say about it, it is first important that we learn what a recumbent bike is. The Recumbent Bikes are similar to regular exercising bikes with the only difference being that these cycles have their pedals in front of the individual riding it rather than just below them, in case of other up right exercise bikes. When on a Recumbent Bike, the riding individual needs to be seated in a reclining position to operate or ride it properly and efficiently. 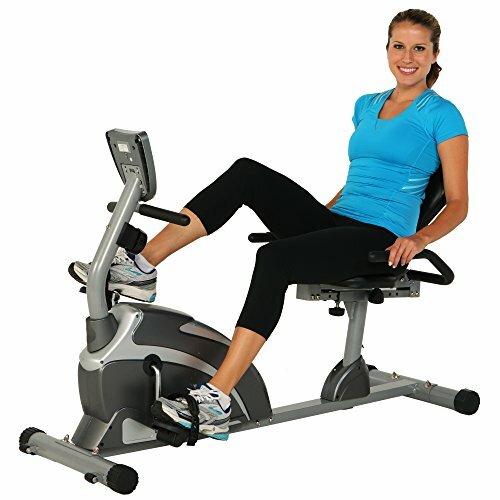 Get the best cardio vascular exercise with this bike. It helps in minimizing your stress levels that are caused to your back and other joints on a regular cycle. The cycle comes with an 8 level magnetic Tension Control System. You can increase or decrease the level as per your exercising capacity. Comes with a LCD display which helps you to monitor the distance you rode, the calories burned, speed at which you have been riding, the time limit, heart rate, etc. The Exerpeutic 900xl extended capacity with pulse comes at a weight of around 63 pounds and can carry up to 300 pounds. The measurements of the bike goes like – 22” W, 34” H and 54” D.
The model also comes with an extended manufacturer’s warranty of 3 years. You will find a whole bunch of brands of recumbent cycle models in the market. The challenge here is to choose the one that fetches you the best result. Here is where the name of Exerpeutic 900xl extended capacity recumbent bike with pulse surfaces repeatedly. Cardio Vascular Exercise – If you are looking for a good source of Cardio Vascular Exercise, this recumbent bike will provide you with just that. The paddling style and the reclining position help you to work a whole bunch of muscles in your body, including the hamstring muscles, quadriceps, gluteal muscles in your posterior and the thighs. It helps to keep your heart healthy and also positively contributes towards the health of your lung. Better Use of Oxygen – Regular exercise on Exerpeutic 900xl extended capacity with pulse trains your body to make use of available oxygen in a better way. It controls blood pressure and the functioning of the heart, making the process of breathing easier, leading to a better flow of blood and oxygen in the body. Increases Strength – The fact that exercising on the Exerpeutic 900xl extended capacity with pulse utilises a lot of your lower body muscles like your thighs, calve muscles, buttocks, etc, also helps in increasing their strength. This helps to cut away excess fat and make lean body mass. It also helps the elderly to regain strength in their lower body bones, allowing more free movement. Helps in Weight Management – One of the main reasons to exercise with the Exerpeutic 900xl extended capacity with pulse is that it helps with weight management. It helps to reduce excess body fat and tones your body in all the right places. Unlike the upright cycles, the Exerpeutic 900xl extended capacity with pulse puts less pressure on the knees and the back of an individual. This means you get all the benefits without having to suffer through the side effects. The fact that Exerpeutic 900xl extended capacity with pulse comes at a pocket pleasing rate makes it more popular amongst the masses. The Exerpeutic 900XL Extended Capacity Recumbent Bike with Pulse makes working out convenient on your body and your bank account. Read unbiased review by fitness experts on Fitnesstep1.com now.